American Metal Treating, Inc is committed to an operating philosophy based on openness in communication, integrity in serving our customers, fairness and concern for our employees and responsibility to the community in which we operate. Our vision is to exceed customer expectations for quality, cost, delivery and value. 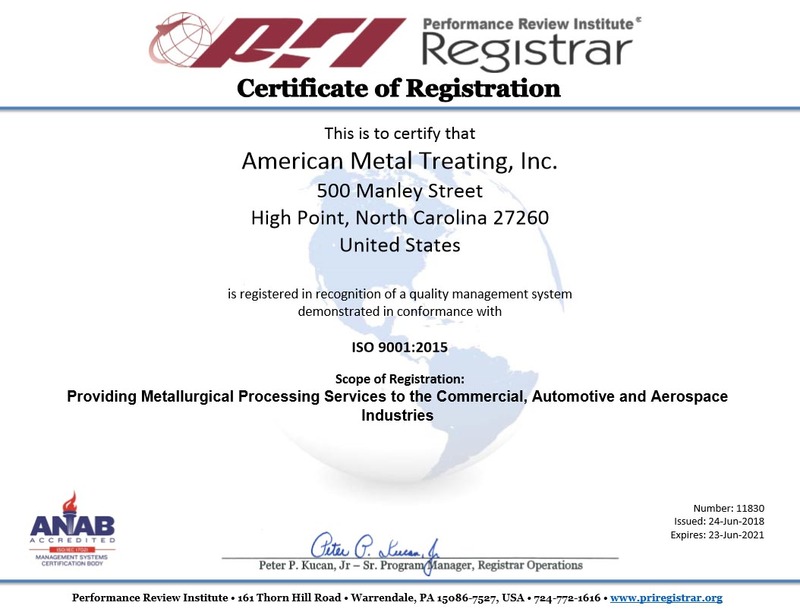 A quality management system has been developed and implemented which demonstrates American Metal Treating, Inc’s commitment to providing services and products which meet our customer and regulatory requirements and provides consistent customer satisfaction. We focus our attention on continual improvement which in turn benefits our customers; our QMS is registered to ISO9001:2015 and also meets the requirements of Appendix B, 10CFR50 for the nuclear industry. It creates a framework for clearly defining the control of processes and verification activities thus providing our customers with the confidence that the services provided by American Metal Treating are performed in a well defined and controlled environment. All questions arising from the customers’ order are resolved before proceeding with processing.